Market dynamics are shifting at unprecedented rates, forcing organizations to respond to change with equal urgency. Technology has become central to digital businesses blurring the digital and physical worlds and enabling dynamic and complex interaction of people, businesses, and intelligent “things.” Organizations must embrace these forces of digital proliferation to create connected digital experiences, or risk becoming extinct. We are the partner of choice for global firms in digital experience platforms implementation. Our expertise extends beyond online environments to wearables and augmented reality components in multi-device and multi-identity environment. Our collaboration with premier partners like SAP Hybris, Magento, Pimcore, AWS, and Salesforce Sales Cloud uniquely positions us to leverage disruptive technologies for re-engineering digital experiences. The days of assets and commerce are gone – and the age of the customer has finally come. Changing business priorities mandate customer obsession at the core of everything. Organizations must master capabilities to meet millions of customers across multiple touchpoints, and yet treat every customer as one. Create value by transforming customer journeys. Get better ROI by delivering personalized solutions based on customer intelligence. Enhance sales and marketing interactions by leveraging customer insights. Design responsive, rich, interactive, and engaging micro-experiences. Deliver proactive customer service that exceeds customer expectations. To deliver a connected customer experience, organizations must start by creating enhanced employee experiences. Happiest Minds Employee Experience service enables organizations to focus on automation and process improvement keeping employee/ associate experiences in mind. Our solutions help you transform pricing management and analytics, learning management, and KPI monitoring to pave the path for enhanced productivity and insights driven decision making at multiple levels in the organization. Drive insights driven sales enablement, conversations and conversions. Provide effective automation and business decision making around key functions like pricing and master data management. Deliver real-time visibility and actionable insights on the shop-floor or ground realities to CXO and leadership. Buying behaviours have changed. This is apparent in the rise of behaviours like ‘showrooming’ – the act of testing a product in-store with the intention of buying it online. To cater to digital consumers, retailers need more than the lowest prices; they need to create a complete omnichannel buying experience for B2C as well as B2B shoppers. Organizations need to be present in their customers’ exact moments of need while ensuring interconnectedness across various touchpoints from customer’s perspective. Maintain a single version of truth for products, content and all digital assets. Leverage advanced analytics to enhance customer understanding. Facilitate customized pricing, personalized recommendations and tailored checkout processes. Garner insights from customer buying patterns to enhance experiences. Connect store and fulfilment center without replacing the existing ERP. The road to customer success passes through the digital landscape. Today’s digitally connected customers expect personalized service, faster response, incredible experience – everywhere, and every time. The need of the hour is that machines, humans and “things” interact seamlessly to anticipate customer needs and create engaging experiences that win enduring loyalty. Effective Customer Relationship Management can help you increase sales, boost productivity and improve customer service – while reducing operational cost and increasing time-to-market. Mine customer trends to direct product development and promotions. Implement data-driven sales and marketing strategies. Personalize communications based on inspired customer insights. Maximize revenues and increase upsell and cross-sell opportunities. Digital Marketing can longer be viewed as an adjunct to traditional marketing. 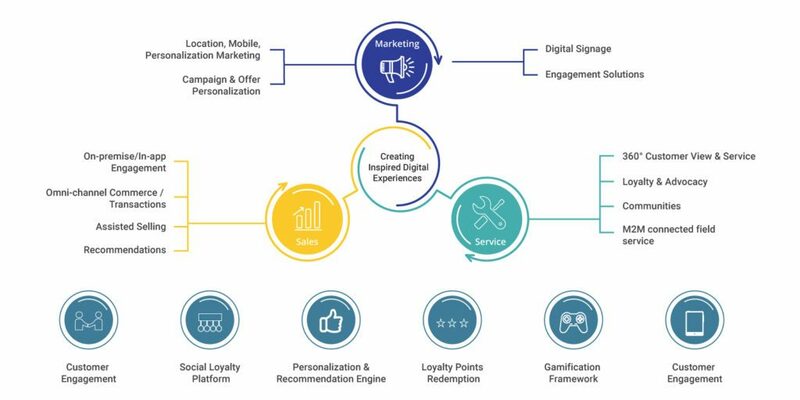 Instead, organization must create a singular strategy integrating digital channels with traditional ones to create inspired connections with customers. Integrated campaigns break down the silos and empower organizations to raise the bar: communicate effectively, understand the pain points of customers, and customize offerings accordingly. Define the strategy and design exceptional digital experiences. Measure impact and enhance end-to-end customer experience. Personalise rewards and promotions to maximize revenues. Our personalization solutions combine multiple sources of data for customer profiling and segmentation and create highly personalized recommendations. Happiest Minds Digital Customer On Boarding (d COB™) solution is designed to digitally disrupt the existing disconnected customer on boarding process. Leveraging cutting-edge technologies..
Happiest Minds application services experts work with you to facilitate application-centric transformation.